A soup made with sweetcorn, cooked chicken breast and spring onion. 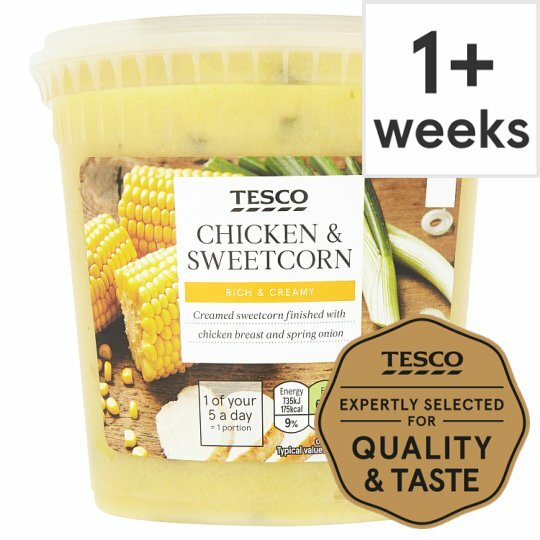 Rich & Creamy Creamed sweetcorn finished with chicken breast and spring onion Just as you would when cooking a soup at home, our experts sauté onions and garlic to create a base and build flavours with selected vegetables and seasoning. Chicken Stock, Sweetcorn (20%), Potato, Chicken Breast (7%), Onion, Double Cream (Milk), Spring Onion, Potato Starch, Rapeseed Oil, Salt, Garlic Purée, Turmeric Powder, White Pepper. Instructions: Chilled: 800W/900W 5½ mins/5 mins. Instructions: From frozen: 800W/ 900W 13 mins/12 mins. Take care when removing and pouring as product will be hot.Warning: Although every care has been taken to remove bones, some may remain.